BLOG — Rille + Co.
One important lesson to always remember in branding: the logo has to suit the personality of the business it's representing. Sometimes I have to reel in my ideas (they can really get out there) and focus on who I'm representing, and who their customers are. The Arizona Association of Health Plans is a local lobbyist, and they needed a fresh look for the new year. I played with a bunch of different directions, but ultimately this simple but impactful, two color logo worked best for them. They mean business, and so does their new logo. I did get a bit playful with the icons on the business card though, which has apparently gone down very well at City Hall, win! When I redesigned my home 3 years ago, I was on the lookout for chic, modern plumbing fixtures, so I headed to Central Arizona Supply. Supporting local is important to me, and Central Arizona Supply has been in AZ since 1968, and their fixtures are absolutely gorgeous. I filled my house with their sinks and faucets and in the process I became a teeny bit obsessed with them. So when Rille & Co. got a call from the team at Central Arizona Supply, I was ecstatic- and not just because I had an excuse to ogle pictures of their pretty light fixtures at the office. 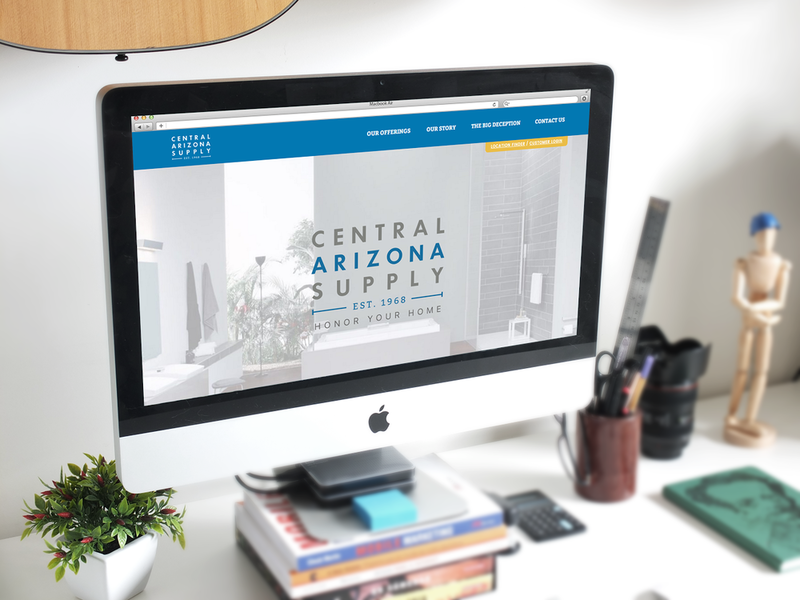 Central Arizona Supply has a rep for stylish, quality fixtures, so we wanted to update their branding to match their vibe, while also conveying their local history. We wanted to give Central Arizona Supply a better way to tell their story and keep customers coming back. We started with an updated logo. We worked on new collateral and a tagline that told a story. And a stylish new website. I love supporting our local businesses (and enjoying constant design inspiration) so it’s been inspiring to work with Central Arizona Supply. And we’ve got more new work with them in the pipeline, so there’s lots more to come! 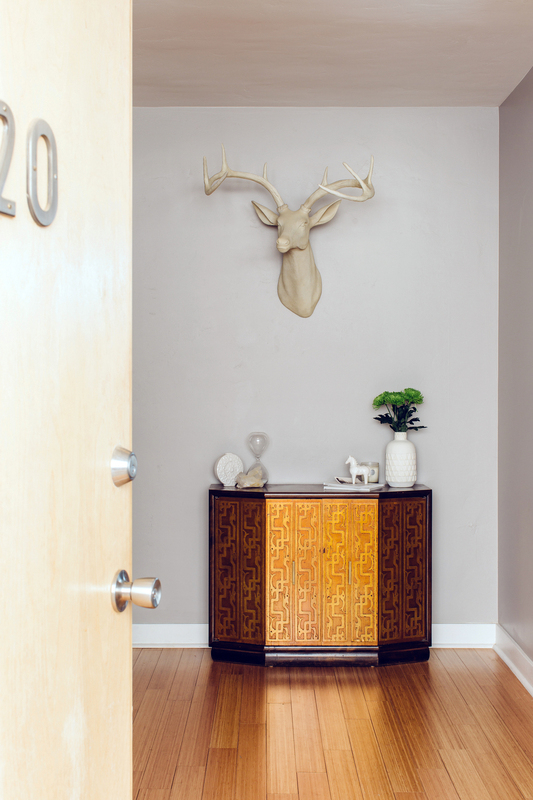 Everywhere I go, I’m always on the lookout for cute spaces and creative gems. When I traveled to China this summer, I was expecting pollution, crowds, and a little bit of dog meat. And I definitely got plenty of all of those. But Beijing surprised me with its cute, quirky places and spaces. My favorite spot in Beijing (aside from world-famous favorites like the Great Wall and the Forbidden City, because there’s nothing else like those) was 798 Arts District. It’s a gorgeous transformed industrial district that reminded me a little of Rille & Co.’s home at The McKinley Club on the artsy Roosevelt Row. The district was full of stunning architecture, repurposed buildings, and all sorts of gorgeous old brick factories. I mean, look at the size of this urban dim sum restaurant. Each store and art gallery was full of quirky antiques, outlandish art, and design inspiration galore. And my favorite part was the blend of Western and Eastern design elements to create a unique, beautiful vibe. Notice the modern, American-style wood elements, and the traditional Chinese dishes? There’s nowhere else in the world that this unique blend of cultures could come about. And there’s no better place to settle down for an afternoon coffee with some stylish Beijing locals. At Rille & Co., we’re strong believers that inspiration can strike anywhere. We love travel, adventure, and challenging ourselves. My escapades in China reinforced to me that there’s no better way to broaden your horizons and enhance your creativity than traveling, exploring, and trying something new. Go somewhere you never expected to go; you don’t know what new beauties you’ll find there. We worked with uber-talented videographer Andrew Gooi of Food Talkies this summer to make some gorgeous videos for our client Southern Rail. we're so excited about how they turned out! Just try to get through these videos without drooling, we dare you. Working with a restaurant definitely has its perks- especially the fact that we could eat all that food right after the shoot. Video content is outrageously popular right now, and for good reason. An Animoto survey showed that a whopping 73% of U.S. adults are more likely to make a purchase if they see a video first. Video content is also the most effective way to breathe life into a brand, and to convey your brand's personality to the public. We love to help our clients communicate their brand messages in beautiful new ways, and we think these videos did just that. Last week, I picked up a copy of Java Magazine, one of my favorite publications for all things Phoenix, and was very excited to see myself on the cover of their September issue! Thanks to our friends at Java for writing the piece. Check it out to read about all the work we've been up to and all the good things coming down the pipeline at Rille & Co.
I’ve always been a huge sucker for Phoenix history. Nothing makes me happier than coming to work everyday in Rille & Co.’s co-working space The McKinley Club, a beautifully renovated historic Phoenix building with a lush green courtyard and exposed brick walls. On top of that, our work with DeSoto Central Market, another historic building in Phoenix, made Team Rille & Co. fall in love with historic preservation projects. That’s why we’re so excited to tell you about our work with The Roland’s Market Building. This building has one of the most incredible histories in Phoenix. You can read the full story of Roland and Jean Ong here, two lovebirds who opened one of the first Chinese markets in Phoenix, inside one of the most beloved and gorgeous buildings in the Van Buren district. The Ong family had an incredible passion for their store, and they were incredibly hard-working and dedicated- not to mention the cutest family on earth. I mean, look at them. But when Roland and Jean gave up their store to focus on raising their kids, the building cycled through a parade of tenants, before ultimately falling into disuse. Once a staple of downtown Phoenix culture, the Roland’s Market building, fitted with classic tin ceilings, exposed brick walls, and charming shop windows, is sitting empty and unused. And in my opinion, that’s a downright outrage. As soon as Team Rille & Co. heard their story, we knew we couldn’t let one of the most iconic buildings in the Van Buren district just sit there. We based these logos on classic Chinese designs with hints of Southwestern charm, while retaining the vintage feel and vibrant red color. There’s still even more to do to bring the building back to life, but we already can’t stop imagining all the possibilities for this building- maybe the next vintage boutique, or a gourmet restaurant, or a young tech start-up will make the Roland’s Market building their new home. We can’t wait to meet our new tenant and to help keep Roland and Jean’s legacy alive. When I crush, I crush hard. My wall was covered in posters of New Kids on the Block back in the 80's. When I was 13 I watched every movie Corey Haim was in, no matter how awful. I still get the odd crush (hello Idris Elba), but these days my crushes are mostly on Instagram feeds: the photos, style and musings of my Instacrushes are inspiring and lustworthy. So you can imagine my excitement when I became the crushed-upon! Luxe Interiors + Design featured Rille & Co.'s feed as their Instacrush for September. Here are a few of the questions they asked that didn't make it into the magazine, but I thought you might like to read anyway. Luxe: What inspires you to take a photo? Celine: It varies for every photo - sometimes it’s a color palette that appeals to me, or a plate of food that looks like art, and sometimes it’s just the urge to share some news about a cool new boutique or event. L: Do you take all of the images with your phone or on a camera? What’s your apparatus of choice and why? C: I was a photo editor and photographer for over 10 years, and even though I have all the gear, I find that I use my phone camera the most. It’s so convenient and I always have it with me, and most of what I capture for Instagram is spontaneous, so it’s a no brainer to just grab my phone. Every so often I’ll take the time to set up my camera and capture something more static, like a flower arrangement or a plate of food, but that’s becoming more and more rare. L: Who are your must-follow instagram accounts? What do you like about them? C: Marte_Marie_Forsberg: She’s a Norwegian photographer that moved to a cottage close to where I grew up in England. Her moody, romantic shots of food and the English countryside make me feel at home. CEDRICDASSESSON: An Italian photographer that shoots water, exclusively. His images are so calming and dreamy, I love it when he pops up in my feed, my eyes find his images so restful. KCSTAUFFER: A local mother of 5 who photographs her kids daily. She has the most adorable twin girls with the most expressive faces. It’s a joy to see what they’re up to. ITSLINDAK: She’s created such a strong aesthetic brand with her minimal, clean images. Plus she shoots all the things I like - fashion, food and spaces. L: In your opinion, what makes a good instagram feed? C: I love feeds that have a visual consistency to them (I’m all about creating a brand), that show off a strong sense of style, and that inspire me either photographically or with their content (beautiful spaces, wanderlust worthy travel pics, or a killer outfit). Exciting news! After lots of hard work, creative juices flowing, and plenty of support from my community, my home has been featured on one of my favorite blogs, Design Sponge, here! One of my greatest passions is creating inviting, personality driven spaces for people to enjoy. I’m very lucky to do that every day here at Rille & Co.! Thumbnail photo courtesy of @emilyquinton. Ahh, springtime! The smell of fresh flowers fill the air, and opening up your Instagram makes you want to scream with the feeling of sheer Insta-inadequacy - all those effortlessly cool accounts you follow flood your feed with adorable spring clothes, incredible vacation photos, and of course, jaw-dropping shots of gorgeous floral arrangements in their perfectly-decorated homes. Trust us, we know how you feel. That’s why Rille & Co. is teaming up with the Florette for a Floral Arrangement & Photography workshop, to teach you the tricks of the trade! Learn how to arrange beautiful blooms and capture them on your camera or phone (you don’t need pro gear to make Insta-worthy photos). We cannot wait for you to meet the Florette, Arizona’s first mobile flower boutique, and we can’t think of anything more adorable and perfect for welcoming in the new season than bringing the Florette to the McKinley Club. The Florette uses 100% American Grown seasonal blooms, which will make your bouquet even more genuine and special knowing that you’re helping the Earth while admiring the beauty that it brings us. To make you feel even more warm and fuzzy, the Florette donates 10% of their proceeds to a cause every month. Imagine how impressed your in-laws will be when you show up to Easter Brunch with this. Join us at the McKinley Club Saturday, March 26th from 10am-12pm. Your ticket will include coffee and donuts to enjoy while you learn, your beautiful handmade arrangement, a classic vessel to hold it, and a take-home guide of how to care for your new bloom-baby! Recently I was scrolling through the Instagram account @_foodstories_ when our content coordinator Natalie glanced at a photo of a pie crust and said, “Oh, I love Food Stories!” She knew immediately which account I was looking at from a pie crust. And that’s the power of branding. When stylistically similar photos bursting with personality fill your feed, they’re easy to remember and care about. Not to mention that looking at a feed full of beautiful photos with a distinct artistic touch is just plain wonderful. These are mostly food photos, often taken from an aerial or diagonal perspective, that are very dark with small, vibrant pops of color. Not to mention that the photos are all styled to perfection. Talk about strong branding. So let’s take a look at some of these simple elements that can make your Instagram feed consistent, stylistic, and unique. Keeping your lighting consistent can be a little tricky when out and about, but it pays off tremendously. Case in point: the deep shadows and natural, moody lighting in @local_milk’s feed. Another option for cultivating a strong brand is using a consistent color scheme, and @saradujour is a strong example. Her photos are all edited with a distinctive beige filter. But be careful with color- there’s a fine line between color consistency and monotony. Consistent content and composition are perhaps the easiest elements, but also perhaps the least practical. With her consistent floral images and scattered composition, @emilyquinton is a strong example. But not all Instagram accounts can manage to be so restrictive. If you’re posting a wide array of subjects, you can add this element in subtle ways: similar angles, cropping, arrangement, and more. The Endless Table constructed by @reynoldskitchens is one of my favorite examples of Instagram creativity. Reynolds deconstructs a photo of a table full of food and turns each of the dishes into individual pictures that, when viewed together, form one virtual endless table. These photos share an obvious brand- after all, they’re all connected. And they’re captivating because they break the traditional “rules” of Instagram. So think outside the box and get creative. Defy Instagram viewers’ expectations, and you’ll cultivate a truly spectacular Instagram brand. Show us your Instagram progress in the comments, or by tagging @rilleandco in your next photo!